With enterprise encompassing far more than simply starting a business, LSBU recognises the importance of providing as many opportunities as possible for students to become involved, gain vital experience and learn sought-after skills. By doing so students develop transferable skills valuable to any career, and seize opportunities to gain experience outside of their degrees. It’s really important because as students we can more easily communicate and share with the other students a lot of useful information about student enterprise. This in turn makes it easier for the Student Enterprise team to spread the word. We can also advise the Student Enterprise team on the best ways to increase their visibility among students on campus. One of the ways the Student Enterprise team is providing support to students and graduates in order to develop practical skills and turn their ideas into a business or career is through the new Enterprise Ambassador scheme. This project was established in spring 2016, with the idea behind it to recruit students to become Enterprise Ambassadors who then help the university increase student participation and engagement in enterprise during their time at LSBU. In turn, LSBU’s Student Enterprise team supports the ambassadors to influence their peers and communicate the various activities taking place and assistance on offer. This is a great way of amplifying the student voice, while students gain valuable experience in key areas such as event management, organising lecture shout-outs and marketing competitions. From this, students gain an enhanced understanding of enterprise and entrepreneurship, and develop key communication, presentation and professional skills. “I became interested in becoming a student enterprise ambassador, as I had previously been involved with student enterprise through the Entrepreneur in Action scheme in my first year at LSBU and then the Make it Happen competition the year after,” says Luke Bailey. “I really enjoyed working with the people in the Enterprise team through the schemes they provided and when I heard about a chance to work as part of the Ambassador team I applied straight away. My role involves helping in the office with admin, setting up and manning job fairs and freshers’ fairs to provide information to the students. I also help the different schools at the university with employability days, get involved events such as competition finals and assist guest lectures and the entrepreneurs in residence with classes such as Develop and Grow." 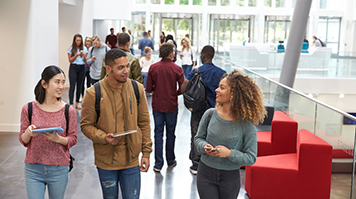 Students have the ability to talk to fellow students about events, which therefore means a greater level of understanding when it comes to communicating about and marketing an event. The role is important as it gives students like me responsibility, exposing me to the working environment, and also encourages me to use my problem-solving skills to think of ways to reach fellow students. With Luke and Arielle clearly demonstrating that the Enterprise Ambassador role is one that brings with it wide and varied opportunities, why do those involved think it is important that LSBU develops projects such as this? These thoughts are echoed by fourth year Business Studies student Naseeba Mhearban, who adds: “Students have the ability to talk to fellow students about events, which therefore means a greater level of understanding when it comes to communicating about and marketing an event. The role is important as it gives students like me responsibility, exposing me to the working environment, and also encourages me to use my problem-solving skills to think of ways to reach fellow students. While it is apparent that all of the students involved feel that the Ambassador role is both important and rewarding, what have they enjoyed most about it so far? “The Student Enterprise team is a delight to work with, we have encountered some very inspiring and motivating speakers, and I am getting comfortable with networking and talking to people I don’t know,” explains Arielle. “For me, I have enjoyed the role a lot so far, as I get the opportunity to do a job that has me working all around the university and that gives me a chance to grow my network by meeting with other students, lecturers and employees of the university. By being involved with student enterprise, it has also given me the opportunity to become a part of the Armed Forces Covenant Panel, which is something that I am so grateful for,” adds Luke. Find out more about LSBU’s Student Enterprise Ambassador scheme by getting in touch with the Student Enterprise team.